Item description: A broadside printed on 1 November 1862 by the Wilmington (N.C.) Daily Journal. 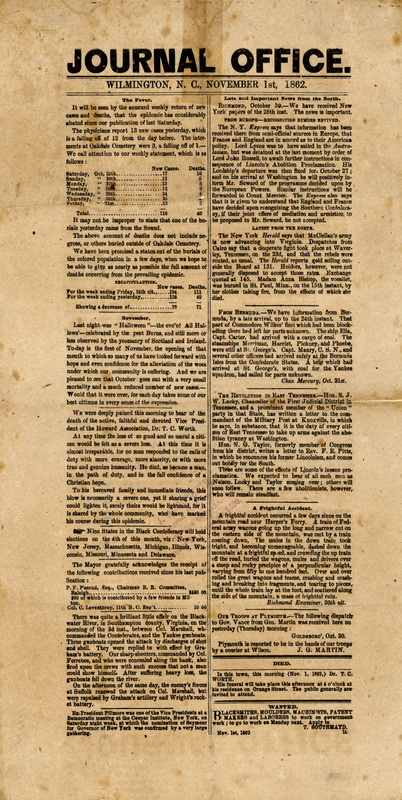 The document reports on an outbreak of yellow fever in the Wilmington area, Halloween, elections and other news from the North, reports of England’s and France’s plan to recognize the Confederacy, and other items of local concern. Item citation: “Journal Office.” (Wilmington, N.C.), 1 November 1862. North Carolina Collection call number: Cb970.79 W74j. Wilson Library, University of North Carolina at Chapel Hill. This entry was posted in North Carolina Collection and tagged blockade, broadsides, disease, elections, England, France, Halloween, health, newspapers, North Carolina, Wilmington, Wilmington (N.C.) Daily Journal, yellow fever. Bookmark the permalink.